I'll be honest, the outfits I usually feature on the blog are not always my everyday outfits. It's not like I dress drastically different from the blog, but in the past few years I've definitely become a staple dresser. Partly, I'm inspired by my husband who is the type of guy who buys 3 of anything he likes. Even jackets! Jackets are his jam. He had to put some in storage, because his closet rod was bowing. You get what I'm saying. If it's in your budget, I highly recommend buying things you love and wear regularly in multiples. You never know when mustard might happen! Or even worse, the store discontinues them! That is the case with my favorite BDG pants, and the inspiration for this post. These first ones are kind of all "Duhs". - Scarf: you probably have 75 of them. They're warm and colorful. - Black coat: sleek, goes with everything. 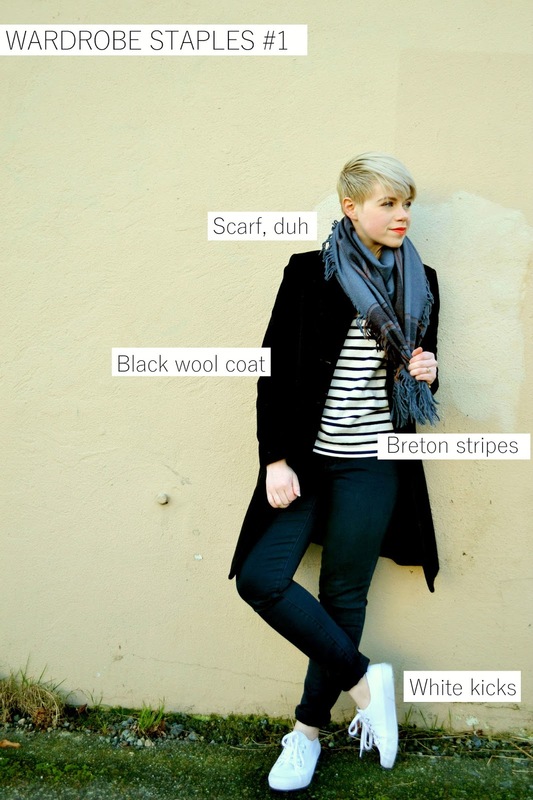 - Striped shirt: I honest-to-god have 11 different Breton striped shirts. My go-to-staple. Goes with almost everything and I feel good in them. Perfect for mornings where I set my alarm for 7am instead of 6:30 and have no time. - White Sneakers: Find a good pair of cheap ones and buy 5 pairs! You will always have fresh, white kicks! I found these on clearance at JCP for $14 and bought 2 pairs, since that's all they had. - Fake Frames: Or, if you need them, real ones! They're perfect for puffy-eye days. Distracts from my bloodshot allergy face! Get a god pair, like the Madewell ones I'm wearing. They have UV protection built in and they're nice enough to have real lenses put in when my eyesight finally goes. - Red Lips: Ok, duh. Another thing I have at least 5 of. My favorite is an called orangey-red from Revlon called Siren. 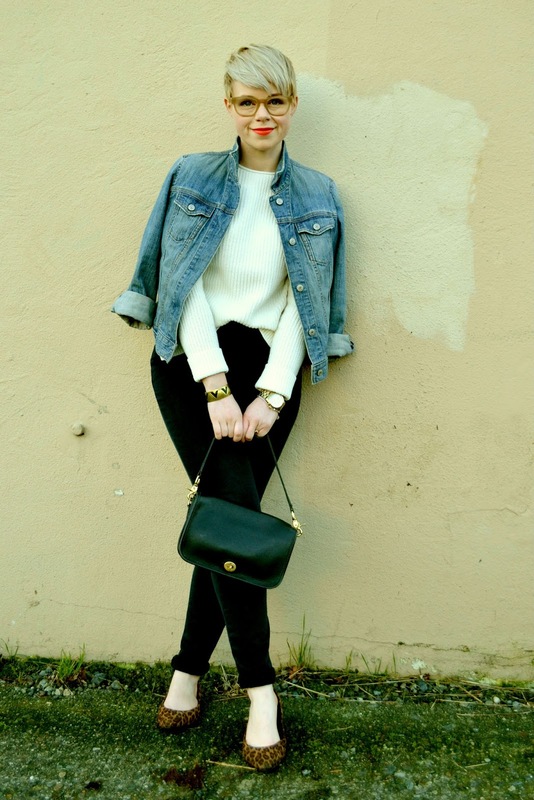 - Denim Jacket: This classic piece should be in everyone's closet! Plus, it's fun hunting for vintage denim! Find a rare one and you could get rich! 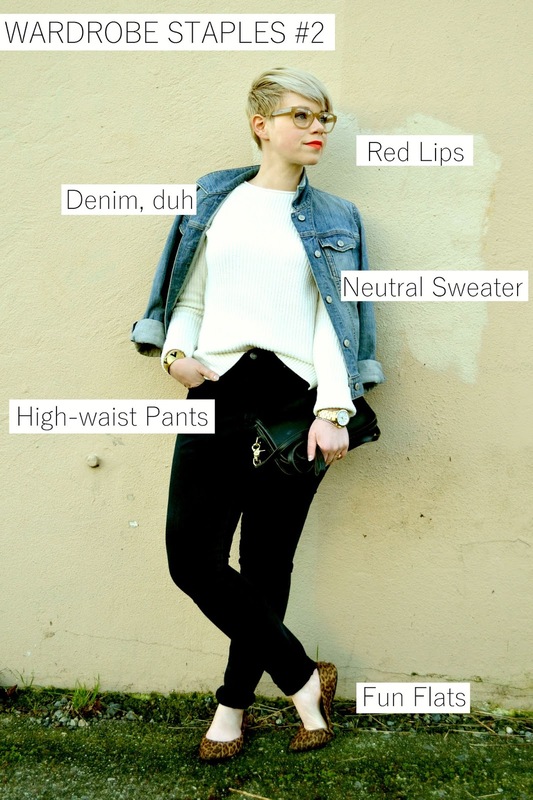 - Neutral Knits: If you live in a warm climate, this doesn't really apply. If not, then you know you need at least 2 good neutral sweaters! Look for good, vintage wool at your local thrift store. It won't pill as badly as new stuff. My favorite is a heather gray men's sweater by Blumarine that I wear probably too often. The one I'm wearing above is from GAP, and it's majorly on sale right now. - High Waist Pants: I've sung the praises of high waist pants before. They're so much more comfortable than the crap the kids are wearing right now. You don't have to pull them up every 5 seconds! My all-time favorites are BDGs that have been discontinued in the past year. I've been on the hunt for replacements and I think these GAP high rise skinnies are it. - Fun Flats: For me, I can't wear anything else. Dumb feet. When I find a pair my feet actually like, I buy as many as possible. Easier said than done, of course. Little Extras: A wear-with-all watch and a classic bag! Oooooooh SUCH good points! This is a great list of staples. I agree totally about the last tidbit of the watch--a watch is SO POWERFUL. these are such great pieces! love both!